Submitted by cynical on December 1, 2010 - 6:58pm. Submitted by jdalton on December 2, 2010 - 11:43pm. Submitted by miasaki666 on December 2, 2010 - 5:50am. Submitted by SammySounder on December 2, 2010 - 9:38pm. Submitted by krupskikevin on December 4, 2010 - 5:38pm. Submitted by trigunotacu on December 6, 2010 - 5:18pm. Who knew Gordon Freeman made webcomics. Submitted by BobIsAPerson on February 17, 2011 - 8:16pm. (this is part 2, click here for part 1!!) Jonathon Dalton STILL hasn't grown a mustache (in spite of it being November, AGAIN) so the crusade continues! Jonathon has been mentioned in 2009's Best American Comics and his graphic novel LORDS of DEATH AND LIFE was recently awarded the Xeric prize (a prestigious award for independent comics) ! 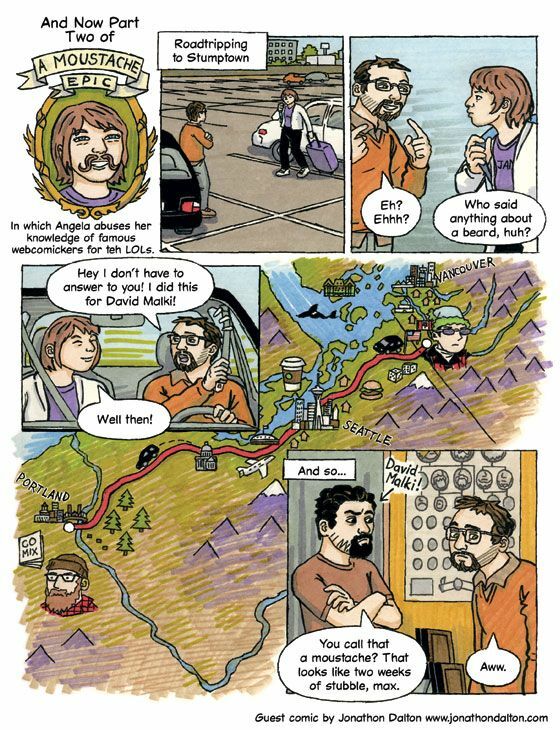 Jon writes comics for smart people -Jon researches his stories like CRAZY. Symbolism, architecture, Mayan way of life and even the language is woven through this tale of myth and war. I've been lucky enough to get a copy of this book and it is preeeeety. GO READ IT ONLINE!